Holidays are a time for giving, and also for giving back. Fourteen years ago a man named Tom Bagamane and his sister decided to pack forty grocery bags and hand them out to homeless people they saw near home and work. 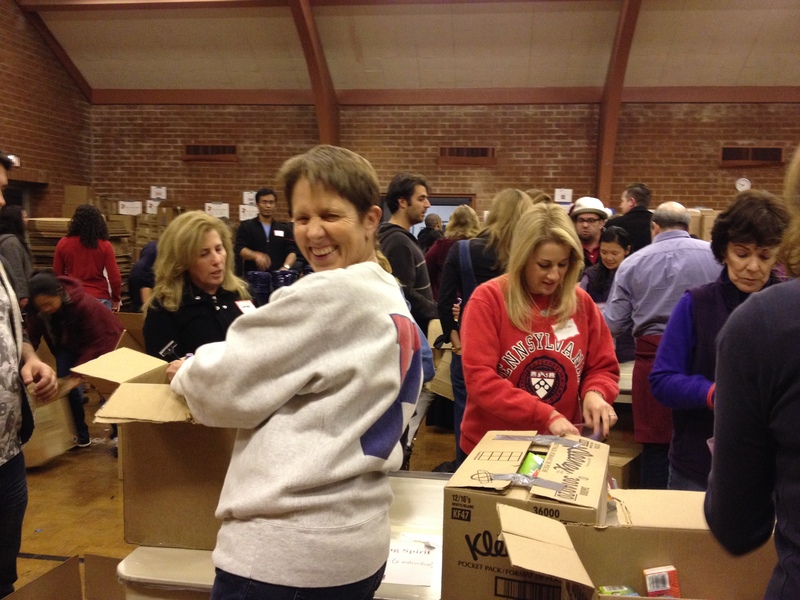 The weekend of December 12 – 15, 2013, volunteers with The Giving Spirit headed to all parts of Los Angeles and handed full duffle bags to 2,600 homeless people. The bags were not dropped off in parks or near shelters, rather The Giving Spirit volunteers found isolated people and interacted with them in the process of handing over a bag filled with fresh and canned food, socks, hats, rain gear, toiletries and the like, along with an industrial strength blanket. 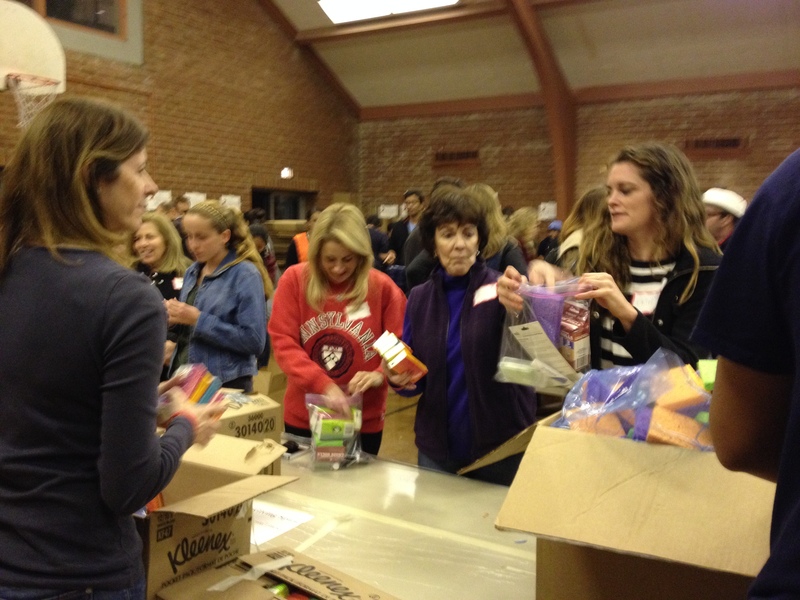 On the Friday night of that weekend, over fifty Penn Serves LA volunteers of all ages congregated at a church in West LA to help to make greeting cards and pack Tupperware and ziplocks with necessities for The Giving Spirit’s bags. As Mr. Bagamane told the Penn crowd, The Giving Spirit knows it cannot cure homelessness, but it hopes to make the holidays and the coldest part of winter just a little easier for “our friends living on the street.” He asked the Penn alumni how it would feel to never hear your name spoken or to line up with your kids just to have a roof over your head for a few hours. The Penn group pitched in for a few hours – some hauling heavy boxes, some joining the assembly lines, some binding blankets. It was a cold night, but we had lots of company and warm food provided by local restaurants…and we were reminded yet again how very lucky we are not to live in a tent or a box on the street. 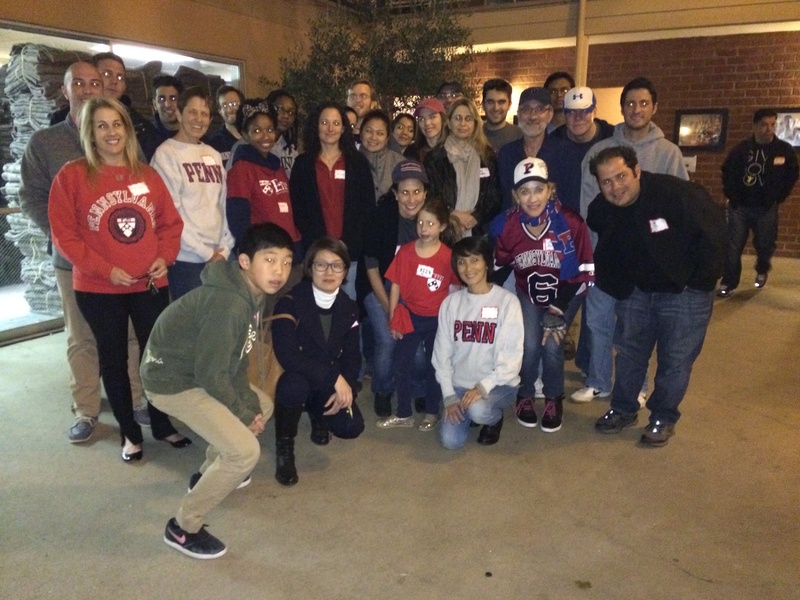 After a fulfilling and collegial evening, our Penn alumni headed back to their cars and homes, and over the Penn shirts they had donned many wore The Giving Spirit t-shirt emblazoned with, “GIVE HOPE LOVE”…and that’s what the holidays are all about! 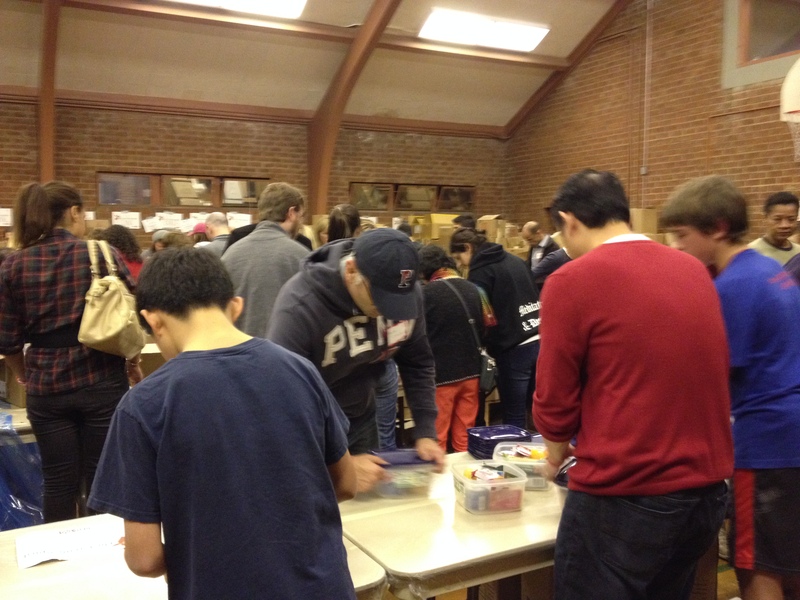 All alumni, Penn parents, families and their children are invited to the next Penn Serves LA event on Sunday, February 23, 2014, from 4:00 – 7:00 pm at One to One Outreach. Back by popular demand, we will return to assemble and deliver boxes of food to the low income, food-insecure of South Central Los Angeles. Children over 8 years are invited to attend. Bring a bit of joy and relief to those in need with us. Click here to sign up for this event. 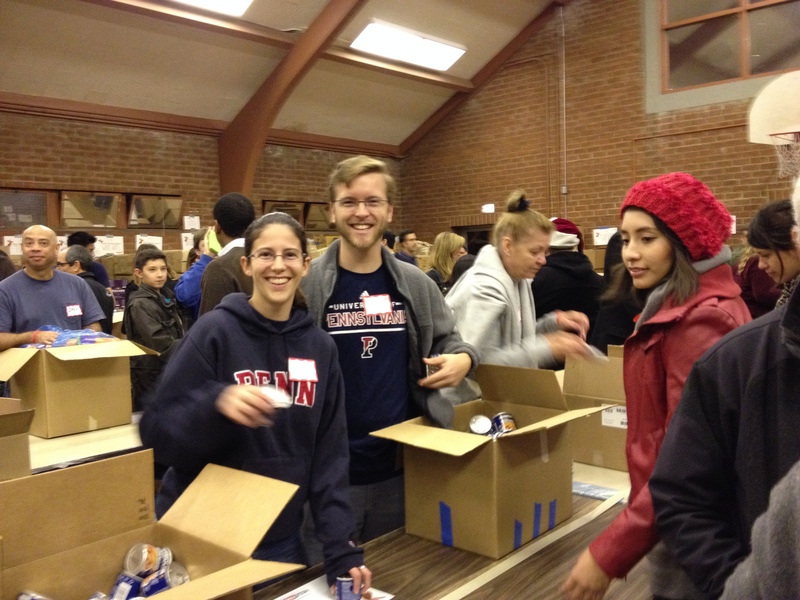 About Penn Serves LA – Started in 2012, Penn Serves offers a way for direct community service for local Penn alumni and their children to serve Los Angeles’ most needy populations. We partner with established nonprofits and grassroots organizations for one-time volunteer opportunities. So far, we’ve served meals to the homeless, delivered food to low income families, planned activities with immigrant children, and so much more. Please contact us if you’d like to help at a future event via email at pennservesla@gmail.com or visit our website.